Ben Mezrich’s latest literary fraud, Straight Flush, continues to amaze the poker world with its blatant rewriting of history regarding Absolute Poker and the crooked college frat boys who ran the company. The first nine parts of this series detailed some of the worst literary sins Mezrich committed in this book, and it’d be easy to go on in the same vein through Part 25 or thereabouts. But enough is enough; the guy’s a liar sitting at a keyboard, and a few more words here toting up the lies won’t really change that. When one considers those frauds, ranging from gross historical inaccuracies to imperative omissions to falsification of the book’s timeline, Straight Flush is actually nothing more than a piece of mediocre fiction using some real people and events as props. Mezrich himself continues on a publicity tour designed to keep him from answering any hard questions about the book, and every time he’s tried to out-argue his critics, he’s fled quickly in the face of the facts being flung at him. This Ben Mezrich book thread at 2+2 is just one of several prominent examples, wherein the fraudulent writer appears and then takes a flier, seemingly never to return, when facing some of the same hard questions posed in this series. Before fleeing into the night when asked to comment on his book’s falsified timeline, Mezrich instead served up gems such as, “Some like the way I write my nonfiction, others don’t; that’s the nature of the beast.” Which utterly ignores the fact that what people are irate about is the “non” part of his fiction. That’s an amazing collection of lies right there. First of all, the site was supposed to have maintained segregated player accounts, particularly after oversight of Absolute Poker’s corporate activities were purportedly under close scrutiny after the exposure of the Scott Tom-led cheating in late 2007. When Black Friday occurred; the company had $55 million in liability to its players alone, and only $5 million in its “war chest”. That’s not a war chest at all; that’s a looting of the company’s liquid assets. I’ve since verified the internal Costa Rican IDS memo concerning the employee-severance needs, which I published myself back in 2010. That total (which was duly paid, under threat of exposure of AP’s money-laundering activities, was $2.75 million. Compared to the $55 million of missing player funds, that’s a drop in the bucket. The company always has deposited IDS operational expenses. The liquidation for all IDS employees is USD$2,750,000. This amount has not been deposited yet into IDS bank account. If next Tuesday, May 3rd, this amount has not been deposited in IDS bank account, I will face all IDS employees and I will explain this situation. After that, I will go to the US Embassy and I will contact FBI agents, who are right now in Costa Rica, and I will reveal all the information I have of Absolute Poker and UltimateBet operations, including full detail of original shareholders, corporate structure, processing procedures, all related companies, lawyers, executives, bank statements, bank wires, emails and instructions I have received, etc. FBI will be more than glad in to grant me immunity exchanging this information. Just a reminder, if anything happens to me, or people close to me, I have prepared 3 sets of this information which are in hands of 3 different lawyers, with instructions to proceed with US Embassy and Costa Rican authorities. I feel sorry about ending our relationship like this way, but my IDS employees are first. Absolute Poker was as fraudulent an operation as ever graced the online poker world. Leggett and Rimola, despite their prominent roles, are among two of the many prominent AP people or corporate entities who don’t even appear in the pages of Straight Flush. You won’t find IDS, nor room manager Gian Perroni, nor Mark Seif, the prominent pro who was onboard at AP about the same time Brent Beckley joined the mix. You sure won’t find Stuart Gordon and Blanca Games and that whole faked-up ownership debacle. You also won’t find Madeira Fjord or Avoine or even Greencat Holdings, almost assuredly one of the Toms’ ownership hiding nooks. Nor will you find any of the crooked lawyers; not surprising, that. Omitting all those real “props” has a secondary effect the uneducated reader won’t ever know: Since the portrayal is so stilted, a number of very juicy anecdotes had to be left out of the book — which I guess is great for the next AP book that comes along. Reviews for Straight Flush are all over the map, though both it and Mezrich himself are getting a well-deserved hammering at Amazon. The most insightful mainstream review comes from James McManus at the Wall Street Journal, as we’ve noted previously. Janet Maslin’s review at the New York Times thoroughly trashes the book on its writing demerits alone, without knowledge that the core story is itself a collection of lies. Maslin famously referred to Mezrich as a “baloney artist” for pulling off some of the crap he tries in Straight Flush in his earlier work. 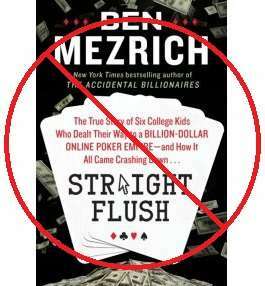 And of those works, it’s interesting to note that Straight Flush‘s blatant fraudulence echoes that of another Mezrich effort, The Accidental Billionaires. A lot of that book’s core story is falsified as well, covering up a rather different history of Facebook that allegedly includes a stolen core concept and a hacking into Harvard servers by Mark Zuckerberg, the famed Facebook founder. Aaron Greenspan, the author of Authoritas: One Student’s Harvard Admissions and the Founding of the Facebook Era, asserts that he was the inventor of a pre-Facebook system at Harvard called houseSYSTEM that was not only emulated by Facebook, but actually used the term “Facebook” as part of its operations. Greenspan eventually sued Mezrich, Mezrich’s personal corporation, Random House Books and Sony Corporation over the falsehoods that wound up in the book and in the resulting movie, The Social Network. Greenspan lost that case, on what appears to be very narrow grounds, though not before it reached the US Supreme Court. The takeaway of all that is that Mezrich’s printed lies already have a history of generating lawsuits. It’s a shame that the poker world is the latest niche market to be polluted by Mezrich’s falsehoods, but that’s what the guy’s about. Ben Mezrich is probably America’s greatest literary liar, though that’s a title no one should really want. There will come a day when Mezrich’s books are yanked from the non-fiction shelves. I, for one, can’t wait.